I spend much of my free time researching the most recent discoveries which give us insight into the many ways that we can increase the health of the brain, the body, our emotions, and our lifestyles. Every resource and tool we obtain will eventually add up to make a big impact on our overall health and wellbeing. I have recently been exploring the use of colored lenses as a simple tool that can be effectively used to enhance cognition and improve both sensory and perceptual acuity. Colored lenses have actually been used in a therapeutic context for sometime now. Helen Irlen is a psychologist who discovered that colored lenses could help reduce the intensity of sensory overload in patients with autism and other brain disorders where sensory overload and visual/perceptual impairment was a significant symptom. Her research also affirms that patients with ADHD, Sensory Processing Disorder, Migraine and Brain Injury show symptom reduction/improvement with the use of colored lenses as an adjacent therapy tool. Many people challenged by depression and anxiety also claim colored lenses are of benefit and help with symptom relief. Personally, I am a big fan of colored lenses. I am completely convinced they can be used therapeutically. I recently acquired a full set of Rainbow OPTX colored lens glasses. I have been experimenting with them for the past week and have discovered that (for me) they absolutely make an impact on cognition. The first thing I must say, is that one pair is not enough. If you can only afford to buy one pair, I would definitely recommend doing it, but having multiple pairs allows for experimentation and broadens the range of therapeutic effects they offer. Yellow: Yellow lenses are stimulating to visual perception. Frequently, yellow lenses are used by athletes to enhance contrast sensitivity. I have found that they have a significant positive impact on my mood during a rainy or cloudy day. I love these because it feels like they enhance mental clarity. Red: Red lenses have become a favorite for “bio hackers”. Human beings posses a very sensitive circadian rhythm. Not everyone knows this, but staying up late in front of the computer or television can be very damaging to your sleep and overall health. The blue light emitted from a screen effects our circadian rhythm and can make a strong negative impact on the regulation of our sleep cycle. Red lenses effectively block this blue light out, which helps the brain maintain integrity of our sleep cycle. Nighttime “blue-blocking” can add up to a major mental performance increase and make a big difference in overall health. Orange: Orange lenses may be a great middle ground in between yellow and red. 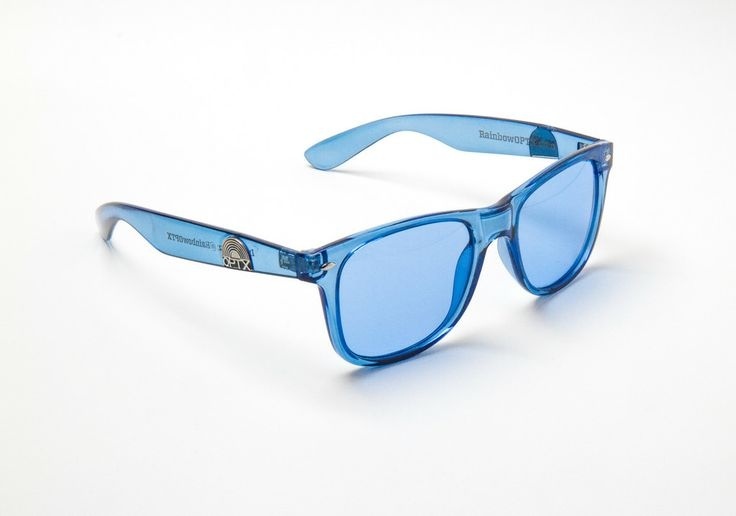 They have the ability to enhance contrast sensitivity and they are also blue-blocking. Perhaps, these are the way to go if you’re on a budget. Blue: Blue lenses are one of my personal favorites. Blue light during the day actually reinforces a healthy circadian rhythm. They help me maintain a calm mood and they also help decrease sensory overload & light sensitivity (which I have). They are subtle, but very effective. Green: Green lenses are similar to blue, (decrease on light sensitivity & sensory overload) yet they have a different “feel” and a very different effect on mood. They are a little more stimulating than blue, yet still helpful for reduction of anxiety. I really love the green colored lenses. Violet: Violet lenses are also very calming and pleasant to wear, for some reason I feel like violet, blue and green would be the best lenses to for reduction of “sensory overload” symptoms. Rose: Rose lenses are definitely the most subtle lenses in the Rainbow OPTX lineup. These would be great to wear daily, because they are so subtle you can easily wear them at night. They are calming as well, and it’s always fun to see the world through “rose colored glasses’. Magenta: Magenta lenses are intense! These actually create a functional sensory overload. They are extremely high contrast, and exploring nature while wearing these glasses literally makes it feel like you are in another world. I discovered that alternating these glasses with the yellow ones, throughout the day, might actually be beneficial in helping the brain make positive gains towards improving sensory processing deficits. I have a theory that you can use these glasses (as well as diffraction lenses) to train the brain to process perceptual information more effectively. By challenging the brain to adapt to different perceptual intervals it may be possible to work the “muscle” of sensory regulation. Indigo: Indigo lenses are also another favorite of mine. They create a similar sensory overload as the Magenta lenses, and they make the world look awesome. They could also theoretically be used to improve sensory regulation, as I just described. I have been wearing these constantly, and when you watch the sunset with them, it’s absolutely stunning! 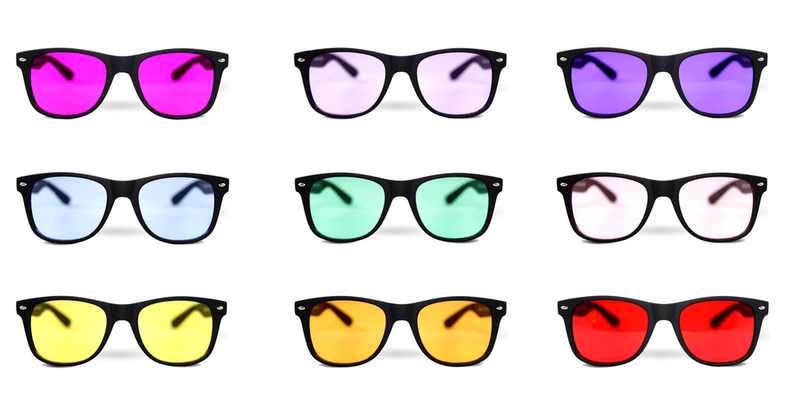 Of all the glasses on the market I researched, I recommend getting Rainbow OPTX glasses. They are “Wayfarer” style glasses, extremely effective, stylish, and very well made. They also provide U.V. 400 protection and offer free shipping on their website. These glasses are also super fun! I’ve been wearing the yellow ones to bring in the sunshine when I’m feeling a bit blue and it works in subtle ways beyond the inner perception shift. Part of the experience is that they are also fun conversation starters. The experience of playfully sharing a different lens of perception with a stranger and getting me out of my shell is another great way these glasses have added value to my day.